Each man has a mark for his hunting equipment. This ivory harpoon head was for killing bearded seals and walrus. The head fit on the end of a hand-cast harpoon and the leather strap connected to a long retrieving line. The fine red lines drawn on the harpoon head are the owner’s personal design. Jane Brower: Aŋuniaġunnaurak tamarra ugruk. Kenneth Toovak: Ii, ixaŋitkii marra ugruganullu, aiviġnullu, ugruŋnullu. Natchiġnun marra aŋiuraqsimarut. Ron Brower: These harpoon points would be used for catching ugruk [bearded seal], walrus and maybe beluga. This one has a stone blade and [base] made out of ivory. This [thong] is ugruk hide tied together with caribou sinew. It would have a shaft that attaches to the main spear, which would be made out of bone. It would have some kind of a design. Some of them have polar bear, some of them have other animal figures, and some of them have other geometric designs. When this is used, you tie this onto another line made with ugruk the same thickness as this. And that can be attached to a float. Some of them would have a bladder float. Some of them would have a small sealskin float. Some of them don’t have any float. It depends on how quickly you can dispatch that animal. 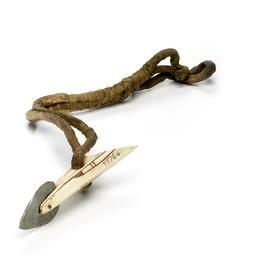 Ron Brower: Naulaq [harpoon point/harpoon head]. A man would have several of these made up. Jane Brower: Aġviqsiuġutipiagataq jade-niqłuk taimña aġnaiyaat imma paqilgitkaat taavani. Aron Crowell: Would you hunt from standing on the ice or from a boat? Ron Brower: You can hunt from standing on the ice, and you can use this from the qayaq [kayak] or from an umiaq [open skin boat]. Aron Crowell: Does an ugruk have breathing holes through the ice like other seals? Ron Brower: An ugruk does have breathing holes, especially in the spring time. But for us they’re more of a migratory animal as compared to natchiq [ringed seal]. Natchiq stays around our area and ugruk come up. Aron Crowell: Do the designs on the side indicate an individual hunter’s mark? Would each person have a different design? Ron Brower: Akkuuvva qiñiqtaŋit iñullaanun nalunaiñŋatauvat? Kenneth Toovak: I think that’s what they are. [Indicates who owns it to] whoever found it in the animal or the water. Ron Brower: Like these two [E089765 & E089764] harpoon [heads] belong to one hunter. They have the same design. Each man has a mark for his hunting equipment. And that differentiates each man’s hunting implements from the others. This [E089756] would be a second person’s hunting implement. You can tell by the barbs that it has. That this guy prefers the two barbs [E089756]. This person prefers the one barb [E089765]. 1. This harpoon head was discussed with harpoon heads E089756 & E089764. 2. According to Iñupiaq Elder Martha Aiken, nalunaiñŋutaq is a “mark for identification” (eg.., on hunting equipment or crafts).